Went outside last night about 10:00 and was able to watch several Fireworks Shows around the area. A lot of the Firework Shows were moved up because of heavy rain prediction for the 4th of July (Monday). Mom went to Church this morning and I stayed home to keep an eye on Dad and it was house cleaning day today. I made some Pancakes for Breakfast this morning. Made them with Bisquick Heart Smart. Also fried up 3 slices of Jennie – O Turkey Bacon. After Lunch went over to see a friend of mine, he had bought a new car and he wanted me to stop by and check it out. Amazing what the new cars are equipped with now! For dinner tonight staying with the Chicken. So last night it Chicken and Fries and tonight It’s Chicken in a different way, tonight it’s Sweet BBQ Chicken Kabobs w/ Whole Grain Brown Rice. Came across a new item at Meijer yesterday and couldn’t wait to give it a try! Tonight I’m trying the new Johnsonville Sweet BBQ Chicken Kabobs. Meijer had 3 different kinds but I wanted to give the Sweet BBQ Chicken Kabobs first. You can grill them or bake them, so I’m baking mine. Our grill died and I haven’t replaced it. So the Kabobs come fresh and in a sealed package of 4 seasoned and skewered Kabobs. To prepare them I preheated the oven to 425°F. Placed the Kabobs on foil-lined backing pan coated with Pam Cooking Spray. Baked for 15 minutes, turning once. And done! How easy is this, a one pan cleanup. Johnsonville has it’s self another winning dish! The Chicken is moist and so tender with nice seasoning. The easiest Kabob I’ve ever prepared! These would be great for parties or grilling out for the family. Looking forward to trying the other types. To go with the Kabobs I prepared some Uncle Ben’s Ready Rice – Whole Grain Brown Rice. To prepare it just microwave. It comes in a microwavable Pouch. Just heat for 90 seconds and serve! Rice comes out perfect, steaming hot and fluffy. I wanted something else to go with everything, something light and fresh. So I went with a Fruit Medley. So out of the pantry I grabbed a can of Del Monte Diced Mango and a can of Dole Pineapple Chunks. I then I chopped up some Cilantro. I opened the cans of Mango and Pineapples up and drained the Juice from each one in separate bowl. I’m going to use juices to flavor the dish. Place the Mango, Pineapple, and Cilantro in a mixing bowl. Stir in the Juice of 1 of the fruits or combinations of all the Juices, no certain amount just adjust it to your own tastes. Stir, and cover and refrigerate for at least an hour before serving. Turned out great, it hit the spot! Fresh and Fruity, nice side. For dessert later a Jello Sugar Free Dark Chocolate Pudding. Get some BBQ flavor on your plate with Johnsonville Sweet BBQ Chicken Kabobs! The sweet and smoky seasonings will get your mouth watering, and the all-natural chicken breast will help you feel good about smart eating. Johnsonville Kabobs are an excellent choice for quick, delicious meals. Preheat grill to medium. Grill kabobs once. Wrap kabobs in foil; grill 8-10 minutes longer or until cooked through. Perheat grill to medium. Grill kabobs for 5-7 minutes; or until cooked through, turning once. Preheat oven to 425°F. Place kabobs on foil-lined backing pan coated with cooking spray. Bake for 13-15 minutes or until cooked through, turning once. Chicken breast, BBQ seasoning (sugar, vinegar powder [maltodextrin, modified corn starch, vinegar], dehydrated tomatoes, spices, molasses solids, smoke flavor, dehydrated red bell peppers, maltodextrin, sodium diacetate, less than 1% of salt, artificial flavor, caramel color, chili, garlic, extractives of paprika, onion powder, citric acid), water and less than 2% of the following: salt, sugar, sodium phosphates. Add some fruit to your meals, and it’s Diabetic Friendly! 1 – On eight 6 – inch skewers, alternately thread Fruit chunks and slices. Place Kabobs in a glass baking dish. In a small bowl combine Orange Juice and Lime Juice; pour evenly over Kabobs. Cover; chill Kabobs for at least 30 minutes or up to 60 minutes, turning occasionally. 2 – Meanwhile, for Dip, in a small bowl stir together Yogurt and Orange Concentrate. Cover and chill until ready to serve. 3 – To serve, arrange Kabobs on a serving platter; discard Juice Mixture. If desired, sprinkle Nutmeg or Cinnamon over Kabobs. Serve with Dip. To help keep those bananas as fresh as possible, try these tips. Put ripe bananas into a sealed plastic bag and place the bag into the fridge. Avoid storing them with other fruits. Store for no more than 2 weeks. Its skin may be blacken after a week but inside will not soften until 2 weeks. If you are going to prepare a fresh fruit salad or a tart, sometimes it’s very difficult not to crush the berries in a mixing bowl or keeping them intact when you are adding trying to sugar them. Try the method of placing the berries in a large plastic bag and adding the sugar. Hold the bag closed with one hand and gently move the berries about with other hand. If you are going to use the berries in a tart, just empty the berries into the pastry shell. Eat Local Longer: A Winter Farmers Market at Findlay! Join us for the kick-off of our winter farmers market on Saturday, December 7 from 8am to 2pm. We will host the market every Saturday in the somewhat warm and friendly confines of the former Globe Furniture building on the corner of Elm and Elder across from the OTR Biergarten. Lots of the same vendors from our regular farmers market will be there, along with some new faces. Check back soon for a full listing of the participating famrers and food artisans you’ll find in our winter market. The mission of our farmers market is to promote local, sustainable agriculture; increase economic opportunities for small family farms and innovative food businesses; provide equitable access to wholesome food; and build a vibrant gathering place for residents and visitors. Products change at all farmers markets as availability waxes and wanes. What may be there one week may not be available the next. So shop often, snap up the goodies you see and you’ll be eating well all winter long. The pomegranate /ˈpɒmɨɡrænɨt/, botanical name Punica granatum, is a fruit-bearing deciduous shrub or small tree growing between 5–8 meters (16–26 ft) tall. The pomegranate is widely considered to have originated in the vicinity of Iran and has been cultivated since ancient times. Today, it is widely cultivated throughout the Mediterranean region of southern Europe, the Middle East and Caucasus region, northern Africa and tropical Africa, the Indian subcontinent, Central Asia and the drier parts of southeast Asia. Introduced into Latin America and California by Spanish settlers in 1769, pomegranate is also cultivated in parts of California and Arizona. The Punica granatum leaves are opposite or sub-opposite, glossy, narrow oblong, entire, 3–7 cm long and 2 cm broad. The flowers are bright red, 3 cm in diameter, with four to five petals (often more on cultivated plants). Some fruitless varieties are grown for the flowers alone. The edible fruit is a berry and is between a lemon and a grapefruit in size, 5–12 cm in diameter with a rounded hexagonal shape, and has thick reddish skin. The exact number of seeds in a pomegranate can vary from 200 to about 1400 seeds, contrary to some beliefs that all pomegranates have exactly the same number of seeds. Each seed has a surrounding water-laden pulp—the edible aril—ranging in color from white to deep red or purple. The seeds are embedded in a white, spongy, astringent membrane. 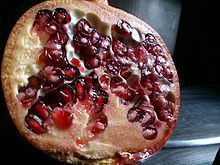 After the pomegranate is opened by scoring it with a knife and breaking it open, the arils (seed casings) are separated from the peel and internal white pulp membranes. Separating the red arils is easier in a bowl of water because the arils sink and the inedible pulp floats. Freezing the entire fruit also makes it easier to separate. Another very effective way of quickly harvesting the arils is to cut the pomegranate in half, score each half of the exterior rind four to six times, hold the pomegranate half over a bowl and smack the rind with a large spoon. The arils should eject from the pomegranate directly into the bowl, leaving only a dozen or more deeply embedded arils to remove. The entire seed is consumed raw, though the watery, tasty aril is the desired part. The taste differs depending on the subspecies of pomegranate and its ripeness. The entire seed is consumed raw, though the watery, tasty aril is the desired part. The taste differs depending on the subspecies of pomegranate and its ripeness. The pomegranate juice can be very sweet or sour, but most fruits are moderate in taste, with sour notes from the acidic tannins contained in the aril juice. Pomegranate juice has long been a popular drink in Armenian, Persian and Indian cuisine, and began to be widely distributed in the United States and Canada in 2002. Grenadine syrup is thickened and sweetened pomegranate juice and is used in cocktail mixing. Before tomatoes (a New World fruit) arrived in the Middle East, grenadine was widely used in many Iranian foods, and is still found in traditional recipes such as fesenjān, a thick sauce made from pomegranate juice and ground walnuts, usually spooned over duck or other poultry and rice, and in ash-e anar (pomegranate soup). Wild pomegranate seeds are used as a spice known as anardana (from Persian: anar + dana, pomegranate + seed), most notably in Indian and Pakistani cuisine, but also as a substitute for pomegranate syrup in Persian cuisine. Dried whole arils can often be obtained in ethnic Indian subcontinent markets. These seeds are separated from the flesh, dried for 10–15 days and used as an acidic agent for chutney and curry preparation. Ground anardana is also used, which results in a deeper flavoring in dishes and prevents the seeds from getting stuck in teeth. Seeds of the wild pomegranate variety known as daru from the Himalayas are regarded as quality sources for this spice. Dried pomegranate arils, found in some natural specialty food markets, still contain the seed and residual aril water, maintaining a natural sweet and tart flavor. Dried arils can be used in several culinary applications, such as trail mix, granola bars, or as a topping for salad, yogurt, or ice cream. Chocolate covered arils may be added to desserts and baked items. 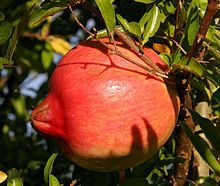 In the Caucasus, pomegranate is used mainly as juice. In Azerbaijan, a sauce from pomegranate juice (narsharab) is usually served with fish or tika kabab. In Turkey, pomegranate sauce (Turkish: nar ekşisi) is used as a salad dressing, to marinate meat, or simply to drink straight. Pomegranate seeds are also used in salads and sometimes as garnish for desserts such as güllaç. Pomegranate syrup or molasses is used in muhammara, a roasted red pepper, walnut, and garlic spread popular in Syria and Turkey. In Greece, pomegranate (Greek: ρόδι, rodi) is used in many recipes, including kollivozoumi, a creamy broth made from boiled wheat, pomegranates and raisins, legume salad with wheat and pomegranate, traditional Middle Eastern lamb kebabs with pomegranate glaze, pomegranate eggplant relish, and avocado-pomegranate dip. Pomegranate is also made into a liqueur, and as a popular fruit confectionery used as ice cream topping, mixed with yogurt, or spread as jam on toast. In Cyprus and Greece, and among the Greek Orthodox Diaspora, ρόδι (Greek for pomegranate) is used to make koliva, a mixture of wheat, pomegranate seeds, sugar, almonds and other seeds served at memorial services. In Mexico, they are commonly used to adorn the traditional dish chiles en nogada, representing the red of the Mexican flag in the dish which evokes the green (poblano pepper), white (nogada sauce) and red (pomegranate arils) tricolor. In preliminary laboratory research and clinical trials, juice of the pomegranate may be effective in reducing heart disease risk factors, including LDL oxidation, macrophage oxidative status, and foam cell formation. In mice, “oxidation of LDL by peritoneal macrophages was reduced by up to 90% after pomegranate juice consumption…”. Despite limited research data, manufacturers and marketers of pomegranate juice have liberally used evolving research results for product promotion, especially for putative antioxidant health benefits. In February 2010, the FDA issued a Warning Letter to one such manufacturer, POM Wonderful, for using published literature to make illegal claims of unproven antioxidant and anti-disease benefits. Persimmons are the edible fruit of a number of species of trees in the genus Diospyros. Diospyros is in the family Ebenaceae. In color the ripe fruit of the cultivated strains range from light yellow-orange to dark red-orange depending on the species and variety. They similarly vary in size from 1.5 to 9 cm (0.5 to 4 in) in diameter, and in shape the varieties may be spherical, acorn-, or pumpkin-shaped. The calyx generally remains attached to the fruit after harvesting, but becomes easy to remove once the fruit is ripe. The ripe fruit has a high glucose content. The protein content is low, but it has a balanced protein profile. Persimmon fruits have been put to various medicinal and chemical uses. Like the tomato, persimmons are not popularly considered to be berries, but in terms of botanical morphology the fruit is in fact a berry. Commercially and in general, there are two types of persimmon fruit: astringent and non-astringent. 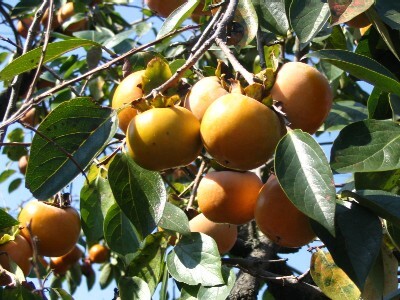 The heart-shaped Hachiya is the most common variety of astringent persimmon. Astringent persimmons contain very high levels of soluble tannins and are unpalatably astringent (or “furry” tasting) if eaten before completely softened. However, the sweet, delicate flavor of fully ripened persimmons of varieties that are astringent when unripe, is particularly relished. The astringency of tannins is removed in various ways. Examples include ripening by exposure to light for several days, and wrapping the fruit in paper (probably because this increases the ethylene concentration of the surrounding air). Ethylene ripening can be increased in reliability and evenness, and the process can be greatly accelerated, by adding ethylene gas to the atmosphere in which the fruit are stored. For domestic purposes the most convenient and effective process is to store the ripening persimmons in a clean, dry container together with other varieties of fruit that give off particularly large quantities of ethylene while they are ripening; apples and related fruits such as pears are effective, and so are bananas and several others. Other chemicals are used commercially in artificially ripening persimmons or delaying their ripening. Examples include alcohol and carbon dioxide which change tannin into the insoluble form. Such bletting processes sometimes are jumpstarted by exposing the fruit to cold or frost. The resultant cell damage stimulates the release of ethylene, which promotes cellular wall breakdown. There is a third type, less commonly available, the pollination-variant non-astringent persimmons. When fully pollinated, the flesh of these fruit is brown inside—known as goma in Japan—and the fruit can be eaten firm. These varieties are highly sought after and can be found at specialty markets or farmers markets only. Tsurunoko, sold as “chocolate persimmon” for its dark brown flesh, Maru, sold as “cinnamon persimmon” for its spicy flavor, and Hyakume, sold as “brown sugar” are the three best known. Before ripening, persimmons usually have a “chalky” taste or bitter taste. Persimmons are eaten fresh, dried, raw, or cooked. When eaten fresh they are usually eaten whole like an apple or cut into quarters, though with some varieties it is best to peel the skin first. One way to consume very ripe persimmons, which can have the texture of pudding, is to remove the top leaf with a paring knife and scoop out the flesh with a spoon. Riper persimmons can also be eaten by removing the top leaf, breaking the fruit in half and eating from the inside out. The flesh ranges from firm to mushy, and the texture is unique. The flesh is very sweet and when firm due to being unripe, possesses an apple-like crunch. American persimmons and diospyros digyna are completely inedible until they are fully ripe. In China, Korea, Japan, and Vietnam after harvesting, ‘Hachiya’ persimmons are prepared using traditional hand-drying techniques, outdoors for two to three weeks. The fruit is then further dried by exposure to heat over several days before being shipped to market. In Korea, dried persimmon fruits are used to make the traditional Korean spicy punch, sujeonggwa, while the matured, fermented fruit is used to make a persimmon vinegar called gamsikcho (감식초). The hoshigaki tradition traveled to California with Japanese American immigrants. In Taiwan, fruits of astringent varieties are sealed in jars filled with limewater to get rid of bitterness. Slightly hardened in the process, they are sold under the name “crisp persimmon” (cuishi 脆柿) or “water persimmon” (shuishizi 水柿子). Preparation time is dependent upon temperature (5 to 7 days at 25–28 °C (77–82 °F)). In some areas of Manchuria and Korea, the dried leaves of the fruit are used for making tea. The Korean name for this tea is ghamnip cha (감잎차). In the state of Indiana (US), persimmons are harvested and used in a variety of dessert dishes most notably pies. It can be used in cookies, cakes, puddings, salads, curries and as a topping for breakfast cereal. Persimmon pudding is a dessert using fresh persimmons. An annual persimmon festival, featuring a persimmon pudding contest, is held every September in Mitchell, Indiana. Persimmon pudding is a baked pudding that has the consistency of pumpkin pie but resembles a brownie and is almost always topped with whipped cream. Persimmons may be stored at room temperature 20 °C (68 °F) where they will continue to ripen. In northern China, unripe persimmons are frozen outside during winter to speed up the ripening process. Compared to apples, persimmons have higher levels of dietary fiber, sodium, potassium, magnesium, calcium, iron and manganese, but lower levels of copper and zinc. They also contain vitamin C and provitamin A beta-carotene (Nutrient table, right). Persimmon fruits contain phytochemicals, such as catechin and gallocatechin, as well as compounds under preliminary research for potential anti-cancer activity, such as betulinic acid. In one study, a diet supplemented with dried, powdered triumph persimmons improved lipid metabolism in laboratory rats. Figs have a short second season in late fall (the first harvest comes in summer) just in time for Thanksgiving. The common fig (Ficus carica) is a species of flowering plant in the genus Ficus, from the family Moraceae, known as the common fig (or just the fig), anjeer (Iran, Pakistan), and dumur (Bengali). It is the source of the fruit also called the fig, and as such is an important crop in those areas where it is grown commercially. Native to the Middle East and western Asia, it has been sought out and cultivated by man since ancient times, and is now widely grown throughout the temperate world, both for its fruit and as an ornamental plant. Figs are among the richest plant sources of calcium and fiber. According to USDA data for the Mission variety, dried figs are richest in fiber, copper, manganese, magnesium, potassium, calcium, and vitamin K, relative to human needs. They have smaller amounts of many other nutrients. Figs have a laxative effect and contain many antioxidants. They are a good source of flavonoids and polyphenols including gallic acid, chlorogenic acid, syringic acid, (+)-catechin, (−)-epicatechin and rutin. In one study, a 40-gram portion of dried figs (two medium size figs) produced a significant increase in plasma antioxidant capacity. Cranberries, native to North America, and are harvested in New England and the Upper Midwest in the fall. Since the early 21st century within the global functional food industry, raw cranberries have been marketed as a “superfruit” due to their nutrient content and antioxidant qualities. 8 Vaccinium oxycoccos or Oxycoccus palustris (Common Cranberry or Northern Cranberry) is widespread throughout the cool temperate northern hemisphere, including northern Europe, northern Asia and northern North America. It has small 5–10 mm leaves. The flowers are dark pink, with a purple central spike, produced on finely hairy stems. The fruit is a small pale pink berry, with a refreshing sharp acidic flavour. * Vaccinium microcarpum or Oxycoccus microcarpus (Small Cranberry) occurs in northern North America, northern Europe and northern Asia, and differs from V. oxycoccos in the leaves being more triangular, and the flower stems hairless. Some botanists include it within V. oxycoccos. * Vaccinium macrocarpon or Oxycoccus macrocarpus (Large cranberry, American Cranberry, Bearberry) native to northern North America across Canada, and eastern United States, south to North Carolina at high altitudes). It differs from V. oxycoccos in the leaves being larger, 10–20 mm long, and in its slightly apple-like taste. * Vaccinium erythrocarpum or Oxycoccus erythrocarpus (Southern Mountain Cranberry) native to southeastern North America at high altitudes in the southern Appalachian Mountains, and also in eastern Asia. Some plants of the completely unrelated genus Viburnum are sometimes inaccurately called “highbush cranberries” (Viburnum trilobum). Cranberries are a major commercial crop in the U.S. states of Massachusetts, New Jersey, Oregon, Washington, and Wisconsin, as well as in the Canadian provinces of British Columbia, New Brunswick, Ontario, Nova Scotia, Prince Edward Island, Newfoundland and Quebec. 20% of the world’s cranberries are produced in British Columbia’s lower mainland region. In the United States, Wisconsin is the leading producer of cranberries, with over half of U.S. production. Massachusetts is the second largest U.S. producer. A very small production is found in southern Argentina and Chile, the Netherlands, and Eastern Europe. Historically, cranberry beds were constructed in wetlands. Today cranberry beds are constructed in upland areas with a shallow water table. The topsoil is scraped off to form dykes around the bed perimeter. Clean sand is hauled into a depth of four to eight inches. The surface is laser leveled flat to provide even drainage. Beds are frequently drained with socked tile in addition to the perimeter ditch. In addition to making it possible to hold water, the dykes allow equipment to service the beds without driving on the vines. Irrigation equipment is installed in the bed to provide irrigation for vine growth and for spring and autumn frost protection. About 95% of cranberries are processed into products such as juice drinks, sauce, and sweetened dried cranberries. The remaining are sold fresh to consumers. Cranberry juice is a major use of cranberries; it is usually either sweetened to make “cranberry juice cocktail” or blended with other fruit juices to reduce its natural severe tartness. Many cocktails, including the Cosmopolitan, are made with cranberry juice. At one teaspoon of sugar per ounce, cranberry juice cocktail is more highly sweetened than even soda drinks that have been linked to obesity. Usually cranberries as fruit are cooked into a compote or jelly, known as cranberry sauce. Such preparations are traditionally served with roast turkey, as a staple of English Christmas dinners, and the Canadian and US holiday Thanksgiving. The berry is also used in baking (muffins, scones, cakes and breads). In baking it is often combined with orange or orange zest. 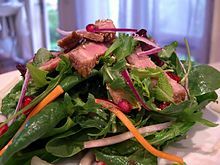 Less commonly, innovative cooks use cranberries to add tartness to savory dishes such as soups and stews.